Whether you're looking to build single extrusion die sets or full tooling fixtures we are your one stop machine shop! Our expertise consists of turning, milling, ID/OD grinding and honing all grades of carbide and tool steel with an emphasis on surface finishing, providing you with quality aluminum extrusion dies that will perform. With a staff utilizing decades of experience in precision tooling, we at Bridge Tool & Die, Inc. can guarantee our commitment to your satisfaction. 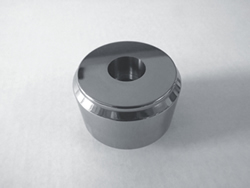 At Bridge Tool & Die we are able to compliment these skills by collaborating with a variety of additional machining capabilities in order to be your complete grind shop. So, whether you're looking to build single extrusion die sets or full tooling fixtures we are your one stop machine shop! Connect with us to get your quote started today.